We had several family members coming to meet together after several years of being apart for several years. The moments were priceless and I can't think of any other place that your wonderfully planned house that has such an aura of family warmth. We couldn't have picked a better place. Thank you so much. Responsive and eager to please. Third time in different seasons and the view is breathtaking. The most relaxing place we have ever been. Easy to find the property and accurate portrayal of the cabin and amenities. Beautiful cabin. We had a great time ringing in my 26th birthday party. Paddle Inn Rafting was awesome. Ask for AJ at the River squid. The view is Breath Taking. The general store has a great selection. IT was awesome bringing Myrtle Beach to the mountains. Thank you so much for everything. We loved the cabin. It was so peaceful and relaxing. Great dcor! Hope to come back this summer. What a lovely way to camp. The cabin, the visits, the ambiance was perfect. Thank you so much for sharing. We were very pleased when we arrived at this beautiful cabin. We rented this cabin to spend some very need time together, We have enjoyed our time here. We hope to come back soon. We made our inquiry and had our reservation confirmed within a few hours. 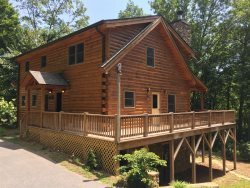 We had decided to take a last minute trip to the Smoky's and we were fortunate to find a property that fit our needs perfectly considering it was a holiday weekend! All of the information provided by GSCR was detailed and timely. They followed through with a call to ensure all was good after we arrived at the property. Thank you. This cabin was exactly what we wanted! Close enough to town but what seemed miles away at the same time. This cabin is nestled high up on a mountain side in a community with several similar cabins. There is ample privacy from among the other homes and we felt this cabin had the best location because it was positioned highest on the mountain side. This cabin is nestled along side of a mountain so there is not a lot of open flat space (only important if you want flat yard space for kids to run around). Highly recommend this property! Great Cabin!! Terrific view! Enjoyed hiking and driving the Tail of Dragon. Get a malt from Soda Pops in Bryson City. Enjoyed the wildlife. The rabbits and the friendly dog JO JO. Very nice accommodations comfy beds, clean, modern appliances and attention to details. We really enjoyed our stay here. This cabin defiantly met our expectations. The cabin is very clean and had everything we needed. The internet worked well. My dad really enjoyed using the grill and made some delicious sausages on the grill. Hot tub was clean and nice. It was very nice to be able to eat on such a nice porch, however I did not see any black bears. Maybe next time. I will highly recommend this cabin and will visit again. Our stay was great. Hiking was awesome. We loved hiking in the mountains. We can't wait to come back again. This is a beautiful cabin and we thoroughly enjoyed the comfort and all that is provided. Thank you for sharing with us. We rented it to celebrate my 50th Birthday and I was in love with the place from the moment I walked in. Would definitely return in the future. The convenience to the places in the Smokies such as Pigeon Forge was great too. Dolly Wood was a blast. We had a wonderful holiday here. I was really beyond our expectation. thank you for this wonderful experience. Thank you for sharing this wonderful cabin with us. My family and I made some beautiful memories here. We loved it and the fact that the community was gated made us feel safe. I loved the privacy and beauty of the cabin. Had everything that we needed. Loved the firepit and there was a supply of firewood. We are very impressed with the view, the cabin and the well water. This week went by quick. So many things to do in this area. Felt very much at home when returning to the cabin every nigh. Was looking forward to relaxing in the hot tub, but with so much stuff to do we wouldn't have had the time to. Rode thru a rain storm in Ga. the paper that I had written the number down on to the lockbox had gotten wet. There was one number we couldn't make out so we called. Spoke with Kathy who had a Wonderful Attitude and was a Delight to speak with! If the rest of your employee's are like her, yall must have a hard time picking employee of the month! We had a Wonderful time, Views are Awesome up there and I really Enjoyed the Peace and Quiet! The team was very helpful when I called. They were very friendly and courteous. They answered all questions that I had. I really enjoyed talking to them. The directions that was sent to us by email got us right to alarka road and to the steps of the cabin. Really helpful directions. Staff was very friendly and help out with any questions I had.